Are you thinking "mobile-first" in your SEO strategy? You should, and here's why. Beyond taking steps to ensure stability through Google's mobile-first indexing, SEOs should think this way in all aspects of their SEO strategy in order to provide the best experience for searchers. Think of searchers as being on a mobile device. Leveraging mobile SEO tools and ensuring mobile friendly status seems simple, but it's worth questioning your approach. Of course this focus is following the customers' lead. More than half of customers turn to their smartphones rather than a desktop computer now to discover, evaluate, and purchase products or services. That number will only go up - fast. That’s why, in this post, I take a look at the most crucial SEO factors to improve mobile search visibility. But first, allow me to clarify something about mobile optimization. The term mobile SEO refers to a set of practices aimed at optimizing a website for both users accessing it through their mobile devices as well as mobile bots from Google. As the number of mobile searches exceeds the ones made from desktops, Google and other search engines have begun putting more emphasis on ranking pages that provide a great user experience on smartphones and tablets. As a result, mobile-friendliness affects rankings. Not to mention that Google also uses a mobile-first index when cataloging and ranking web pages. Mobile SEO vs. Desktop SEO: What's the Difference? In principle, mobile SEO isn’t that different from the desktop. Content, technical optimization, and links still determine how pages rank in mobile SERPs. Where the two disperse, however, is in the user experience. For one, different standards apply to presenting information on mobile devices, largely due to the screen and technology limitations. What goes with it are some guidelines and rules you currently follow that may no longer work. Size of text links or buttons is a good example. You can place these elements near other text or graphics on a desktop site. A user will have no difficulty pointing the cursor at them and clicking. On a mobile device, however, you deal with much smaller real estate (not to mention that you have to consider customers using their fingers). This, in turn, might result in a person having problems navigating to the right content, then, abandoning your mobile pages, and as a result, sending poor UX signals to Google. Another example – the title tag’s length. In some cases, Google seems to allow more characters in mobile search listings. In others, it will cut it right before some crucial information, even though it displays it on the desktop. Image from a search by a client in Ireland comparing SERP display between mobile and desktop. Poorly optimized title tags could result in more than just a low click-through rate. Attracting the wrong traffic, in turn, would mean a higher than usual bounce rate, and again, poor usability signals for the search engine. Finally, users search on mobile devices in more ways than by typing keywords into the search box. 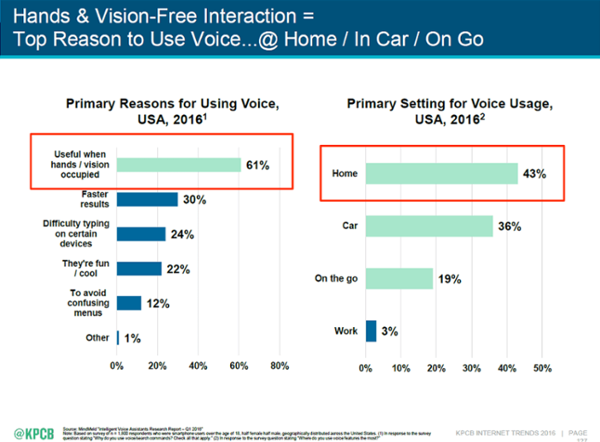 Google Voice Search, Siri, and many other applications allow them to find information without even having the device at hand. And so, your SEO strategies must also focus on ensuring that any content you publish engages mobile users. Optimizing for mobile SEO is a vast topic. It exceeds what I can include in this post. However, there are some basic guidelines I’d like you to know about mobile SEO. First, you can create a separate, mobile version of your site. Typically, such sites’ URLs start with the “M.” prefix to denote mobile site. Such a version is independent of your main website. A browser determines what device a person’s using to access your domain and serves them either the desktop or the mobile version. In practice, this means redirecting (via HTTP redirect along with a Vary HTTP header) to an appropriate mobile page serving a completely different code than the desktop site and on separate URLs. The main benefit of building a mobile website is that you create it for smartphones and tablets natively. The disadvantage is that, with the mobile site, you have to manage two versions of your website independently. What’s more, as we’ve noticed, sites with separate URLS (mobile and desktop, in this instance) will take longer to move to the mobile-first index. Second - Dynamic serving that uses the same URL but triggers either mobile or desktop HTML pages, depending on the device a person uses to access it. Again, the benefit is the ability to optimize the code for mobile devices well. The downside is having to manage and maintain two different codes. The third option is responsive design (and it’s the option recommended by Google.) It’s also the one we’ve been recommending. Why, because a responsive design serves the same HTML code on the same URL regardless of the users’ device. With it, you have to manage a single website only. Instead of serving a different version to mobile visitors, the design amends itself to fit a person’s screen size. In fact, Google Search Console now reports on mobile usability issues with the site. In many cases, it will also point you in the right direction to fix them. Most the time these searchers have the same intent on device now given the possibilities of smart phones and improving network speeds. Certain factors, however, can and will affect the mobile user experience, rankings, and the search visibility. Here are the most critical ones. Let’s face it; if users have to squint or pinch the page to see what’s on it, they’re not going to keep reading it for long. Take a look at this example. I took this screenshot with my iPhone and that’s as much as I could do with it. I can’t read any of the content without pinching. I can’t access, let alone, read the navigation, either. And needless to say, there’s little chance that I’d stay on it for long. Your mobile pages should not only display well on smartphones and other mobile devices. They must also allow users to consume the content without experiencing any major difficulties. For example, you should use big enough font size. Some experts say that 14-point font type is ideal for mobile. However, it always pays off to test your pages on a smartphone and judge the size this way, too. This issue appears within Google Search Console reports and the Google Mobile Friendly Tester. To me it's the first thing to address with development and design teams as it opens up the idea that the experience on a mobile device is what we're after within mobile SEO in 2018. Another thing: write your content in short paragraphs that are ideally no more than two or three lines long. One reason is that shorter paragraphs or segments of content seem less intimidating to read on a mobile device. Plus, they’re easier to skim, a behavior many users employ when consuming content this way. 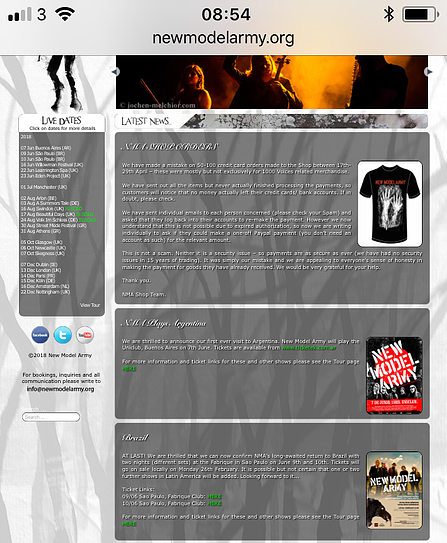 Finally, use strong contrast between text and the page’s background. Many people would use their smartphones outside. The low contrast could make your pages harder to read in broad daylight. The issue of improving the time a person would have to wait to access your mobile page has been on SEOs' minds for quite some time - and rightly so. Google has already been using page speed as a ranking factor. Plus, it has been pushing it even further in the mobile-first index to a point where it could demote rankings if a mobile page were too slow. Not to mention that, according to the search engine’s latest data, slow load time can have catastrophic consequences for a brand. As Google reports, a single second delay in mobile load time can reduce conversions by up to 20%! The search engine even offers a Mobile Page Speed Test tool, loading your site in 3G to simulate slow networks. 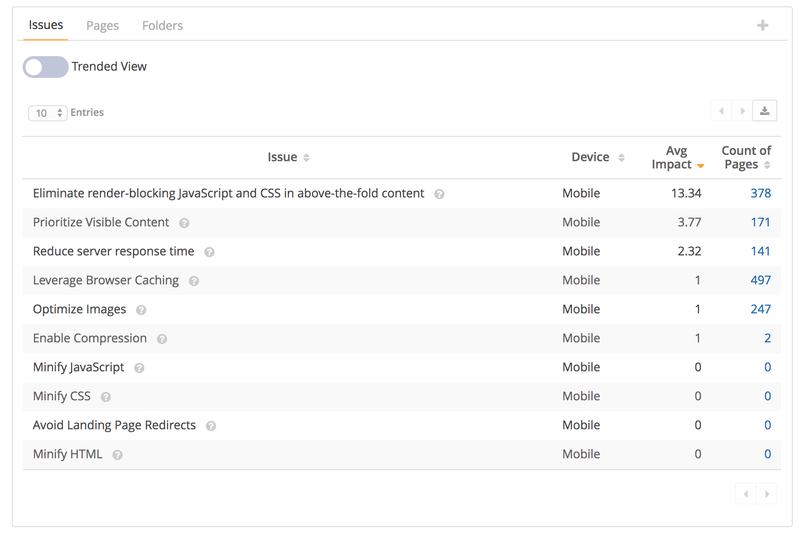 Naturally, the tool analyzes mobile page speed only. However, delays for desktop users will most likely affect your visibility too. And so, when inspecting the page speed, it’s a good idea to get the full picture of your site’s performance. 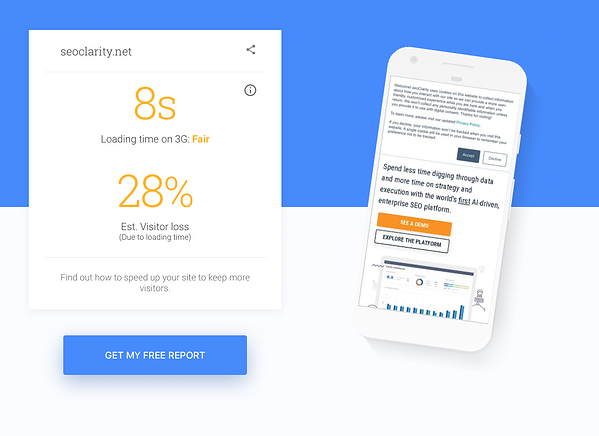 seoClarity offers the insight into both page speeds and reports on where any issues occur specifically. With it, you can eliminate issues that can hinder usability for both, desktop and mobile users, improving search visibility overall. Many SEOs block Googlebots from accessing files that do not help Google index a page. This should now be undone so Google can fully render the page. The following settings will mimic a smartphone as opposed to the desktop: (Mozilla/5.0 (iPhone; CPU iPhone OS 8_3 like Mac OS X) AppleWebKit/600.1.4 (KHTML, like Gecko) Version/8.0 Mobile/12F70 Safari/600.1.4 (compatible; Googlebot/2.1; +http://www.google.com/bot.html). Traditionally, mobile sites feature less content and fewer features than their desktop counterparts. Since companies want to provide the fastest and most streamlined UX on a mobile website, it made sense to remove anything beyond the most necessary information. While there has been a lot of discussion on the approach to mobile content, Google itself has suggested that it's okay to hide content using a Read More button. This strategy supports the user experience and is not recommended for desktop since expandable content makes most sense on a smaller mobile device. It's important, however, that you maintain your mobile page to contain all content you want to use to convince Google of its authority. Re-design the content for the mobile experience so that a mobile user can do and learn the same information as if they were using a desktop. This may involve re-ordering the information, but try not and simply cut out sections that bear importance. In the age of mobile-first, there are many differences that must be considered between desktop and mobile - primarily, the differences in search behavior. This is because Google interprets each user's likely intent through micro-moments that impact how the SERP is constructed and the types of content that will appear. If the search engine believes the user wants to find a restaurant, the local 3-pack will appear. If the user expresses an I-want-to-know micro-moment, then a Google Quick answer will appear. Google also varies the number and placement of videos and images on the SERP depending on the likely intent. 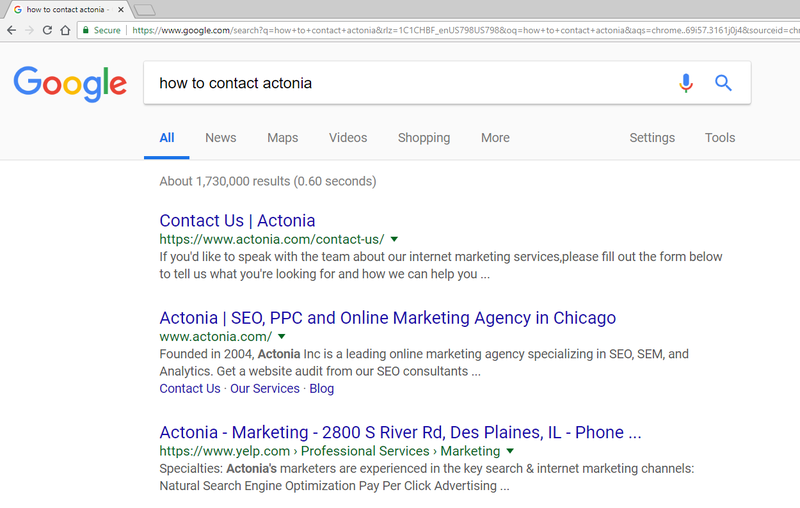 In a search for "how to contact Actonia" on mobile and desktop, the desktop result has a "Contact Us" page as the first result while on mobile, the third result is a "Click to Call" action button. In another difference between mobile and desktop, Google also uses different lengths for mobile and desktop meta descriptions to best fit the user experience. The meta description length is now shorter on mobile devices. You can use up to 120 characters when optimizing your listing for mobile search. After the most recent updates, however, your desktop description could be up to around 158 characters. As it turns out, your meta description must work in two different lengths. Luckily, we know some ways to work that into your strategy. 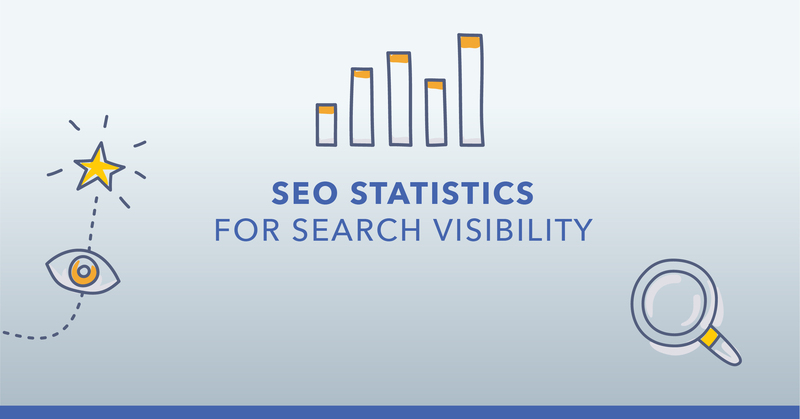 First, in seoClarity, use the Analytics report to establish how much of your traffic comes from smartphones. Then, filter that traffic by the most visited pages. Look for assets that attract the majority of their traffic from smartphones. You can see that in the “% of total traffic” column. Finally, use Content Fusion, our AI-powered content editor to write new, mobile-optimized descriptions for those pages and compare them with top 5 pages ranking for your main keyword. When writing your descriptions, remember to put the most interesting information at the start. This way, even if Google cuts out some of the copy in mobile SERPs, a user will still discover the key benefits of clicking on your listing. 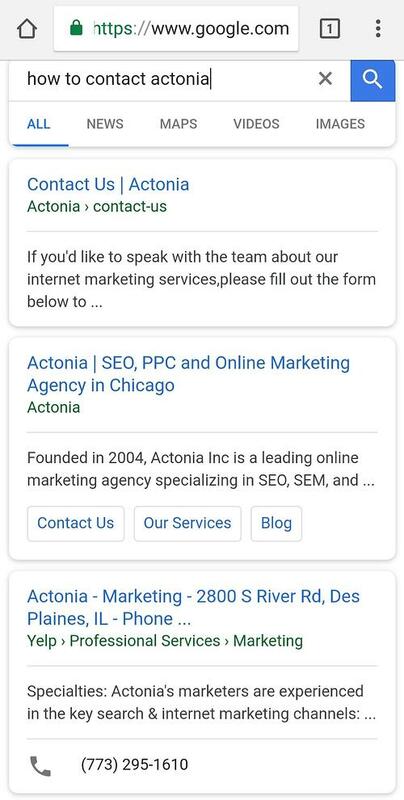 seoClarity users can also leverage a mobile SERP Snippet report that will reveal the title tags and description tags as found on a Google mobile results page, a direct reflection of how Google users on mobile devices are seeing your listing on Google after re-writes and shortening updates. Remember to revisit your content strategy to ensure that you are factoring in both mobile and desktop optimized content for both types of user. Be sure to add the proper HTML tags to allow a mobile user to call or get directions to your business. The absence of the click to call function here is the ultimate mobile-first miss! After all, with the rise of local-intent, “near me” mobile searches, ensuring a proper local optimization has never been greater. 1. Report on technical optimization. In particular, use this opportunity to showcase the progress with ensuring compliance with mobile ranking factors. Review the page speed of the mobile site. Aside from reporting on overall mobile page speed, seoClarity also provides detailed recommendations for improvements. Clicking on the number of pages to the right reveals which content has been affected by the issue and what you should correct there. 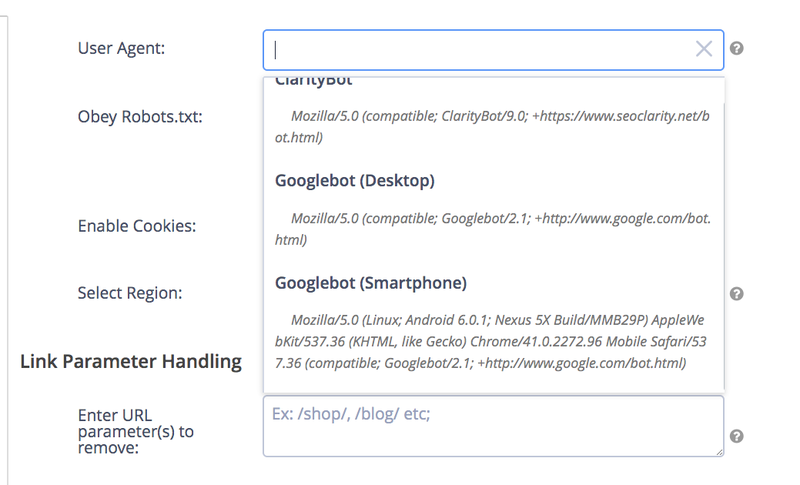 Finally, when setting up the Site Audit, you can select googlebot (smartphone) as the user agent to conduct a mobile site crawl only. With 64% of Google traffic coming from mobile devices, it’s imperative to show how your website performs for mobile searchers. 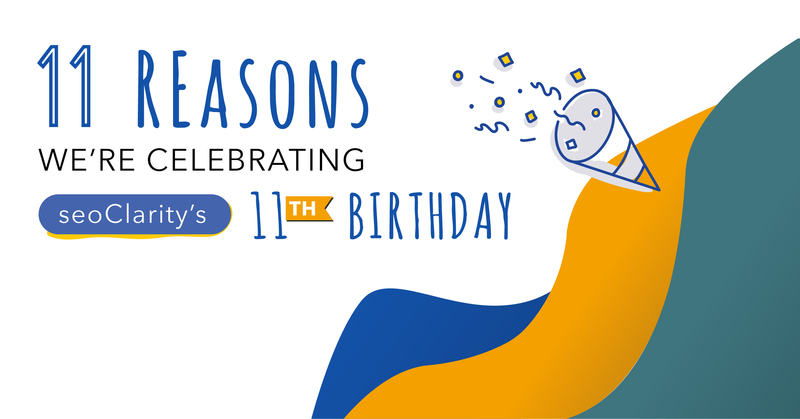 seoClarity offers a number of ways to do so. 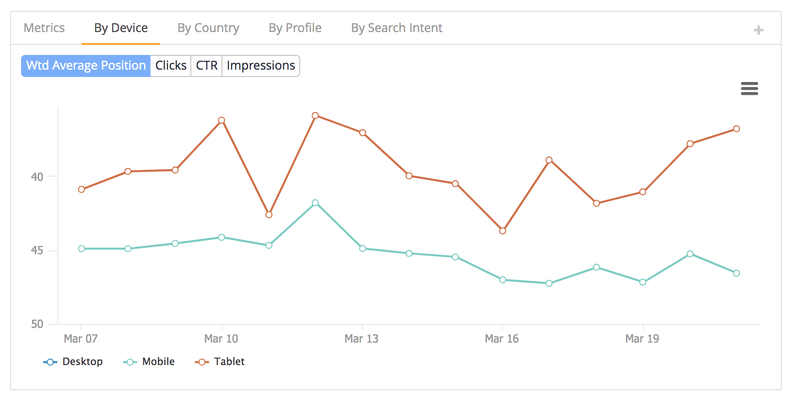 First, you can review mobile traffic in Search Analytics. The report below shows ranking changes for mobile and tablet devices. With Rank Intelligence, you can review changes in Google Mobile rankings for the time frame you’ve specified. You can also review both desktop and mobile rankings side by side. Often, desktop and mobile rankings differ for the same keyword, and it’s critical to monitor them to gain the true understanding of your visibility. More and more people today make mobile devices their first choice when looking for or evaluating new products or services. As a result, improving search visibility has more to do with mobile SERPs than just responsive design and desktop version of your site. The 6 critical SEO factors above can impact your success in mobile search. Editor's Note: This post was originally published in June 2018 and has been updated for accuracy and comprehensiveness.